This fabric + a little time + my sewing machine = this treat or treat bucket. Not from a pattern. Just a little playing around. Sewing, for the sake of sewing. 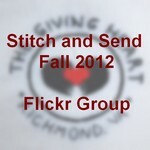 Put aside the camera, shun the thoughts of another blog tutorial and just stitch. It was quite wonderfully organic. And very relaxing until I had to figure out how to piece together the orange trim from not-enough-scraps from another project. The kiddos sure were surprised. And they began right away filling their treat buckets with everything not-Halloween; aka, cars, babies, and trains. What are you stitching for Halloween?